Tasha Reid is a Korean-American R&B singer and rapper born in Portland, Texas on May 31, 1981 to an black American father and a Korean mother. She was a core member of the Korean hip hop and R&B group Uptown, starting out when she was only 16 years old. She later formed Tashannie, a hip-hop and R & B duo in 1999 where she was the primary vocalist. In 2001, she started a solo career under the moniker T.
Tasha, who speaks Korean and English fluently, is one of the most influential rappers in Korea as well and is among the most influental female rappers. After settling a dispute with her former record company, World Music, Reid's new album was released in February 2007. 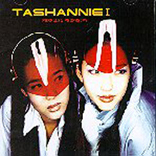 Tashannie was a Korean hip hop and R&B duo. The duo consisted of Tasha Reid (aka "Baby T") and Annie Lee (aka "The Tse"). Tasha was primarily the vocalist while Annie was primarily the rapper. The duo's only album was the highly acclaimed Parrell Prophecys released in 1999. The duo however did not see eye-to-eye on the group's direction and broke up. She displayed her hip-hop at the Drama original Sound Korea 2007 in Tokyo, applause from some 2000 people in the audience. Yoon sang "After Pain Subsides," the theme song of the SBS TV drama "Prague Lovers," which is airing in Japan. Her unique style of voice that is quite rare in Japan captivated the hearts of Japanese listeners. Yoon was the only performer at the concert to receive a curtain call, in which she sang "Scent of Life," a song from her first album. The singer's agency says Yoon will, at the minimum, hold some small-scale concerts soon in Japan to target the Japanese music market.